The phagocytic NADPH oxidase (NOX2) plays a fundamental role in host defense and innate immunity. Here we demonstrate that external ATP triggers rapid cellular oxidation inhibited by diphenyleneiodonium in endotoxin-primed J774 macrophages and primary murine bone marrow-derived macrophages. To identify the source of reactive oxygen species (ROS), we compared responses between wild-type and NOX2-deficient macrophages. ATP-mediated ROS production was strongly attenuated in NOX2-deficient macrophages where responses were comparable to inhibition with diphenyleneiodonium. Notably, spatial differences in superoxide anion formation were observed where ROS formation was partially antagonized by extracellular superoxide dismutase in primary bone marrow-derived macrophages but unaffected in J774 macrophages. Loss of NOX2 was not observed to affect ATP-induced cell death. However, ATP-evoked cell death was found to be partially dependent on caspase-1 and cathepsin B activation. In conclusion, NOX2 plays a fundamental role in conferring macrophages with the ability to respond to extracellular ATP stimulation with robust changes in cellular oxidation. Adenosine triphosphate is an extracellular signaling molecule that binds to a number of membrane proteins, including ionotropic P2X receptors (1). Secreted ATP plays a fundamental role in numerous events from CNS transmission to platelet aggregation. Cells of the innate immune system express P2X7 receptors that bind ATP to trigger proinflammatory signaling cascades, including secretion of proinflammatory cytokines and the generation of reactive oxygen species (ROS)3 (2, 3, 4, 5). P2X7-deficient mice have demonstrated a role for P2X7 in the progression of collagen-induced rheumatoid arthritis, inflammatory and neuropathic pain, as well as the development of bone (6, 7, 8). From these studies, it is proposed that P2X7 receptors play a key role in chronic inflammatory signaling pathways in vivo and provides a promising therapeutic target in the management of chronic inflammatory conditions. Indeed, several selective P2X7 receptor antagonists have been developed in the last 5 years (9, 10, 11). P2X7 receptors are reported to trigger rapid oxidative stress via activation of NADPH oxidase (2, 4, 12). Aberrant NADPH oxidase signaling can contribute to a range of chronic inflammatory conditions, including inflammatory pain and vascular atherosclerosis (13, 14). For example, macrophage NADPH oxidase activity contributes to the oxidation of lipids in atherosclerosis and may contribute to the progression of vascular injury (13, 15). Activation of phagocytic NADPH oxidase (NOX2) requires assembly of a multiprotein complex consisting of two membrane components gp91phox/NOX2 and p22phox that recruit several regulatory proteins from the cytoplasm (p67phox, p47phox, p40phox, and p21Rac) (16). The potential role for NADPH oxidase in ATP signaling is currently largely based primarily upon pharmacological inhibitors (2, 4), although NOX2 knockdown via small interfering RNA has demonstrated partial involvement in ATP-mediated oxidation in a RAW246.7 macrophage cell line (12). We have extended these studies to investigate the role of phagocyte NOX2 isoform in ROS generation following nucleotide stimulation of endotoxin-exposed primary murine macrophages. Using NOX2-deficient macrophages, we have demonstrated the critical role of NOX2 in ATP-mediated oxidation. Moreover, we have compared nucleotide-stimulated oxidation in primary macrophages with J774.2 cells, a commonly used murine macrophage cell line. All reagents were obtained from Sigma-Aldrich unless stated otherwise. Cell stimulations were conducted using an external physiological salt solution containing 147 mM NaCl, 2 mM KCl, 10 mM HEPES, 12 mM glucose, 2 mM CaCl2, and 1 mM MgCl2 (pH 7.3 with NaOH). The J774.2 mouse macrophage cell line (European Collection of Cell Cultures) was maintained in complete medium consisting of DMEM/F12 media containing 10% (v/v) heat-inactivated FBS, 2 mM l-glutamine, 100 U/ml penicillin, and 100 μg/ml streptomycin (Invitrogen) at 37°C in a humidified atmosphere of 5% CO2 and 95% air. Cells were detached by mechanical scraping. For LPS priming, J774.2 cells plated overnight in complete medium were incubated for 4–6 h at 37°C with 1 μg/ml LPS from Escherichia coli 055:B5. Mouse bone marrow cells were collected from femurs of control group C57BL/6 mice (8–12 wk old) or NOX2−/− mice (C57BL6/J background, 8–12 wk old) by flushing with bone marrow medium consisting of RPMI 1640 containing 15% (v/v) heat-inactivated FBS, 2 mM l-glutamine, 100 U/ml penicillin, and 100 μg/ml streptomycin. Cell suspensions were centrifuged at 240 × g (S4108 rotor, Beckman GS-15R) for 10 min at room temperature. Cells were resuspended in bone marrow medium and cell clumps were dispersed. Adherent bone marrow cells were removed by incubation at 37°C for 4–6 h in T25 flasks. The nonadherent bone marrow cells were placed in fresh T25 flasks and M-CSF was added to give a final concentration of 10 ng/ml (17). Cells were maintained in culture at 37°C in a humidified atmosphere of 5% CO2 and 95% air. Media and M-CSF were completely changed on day 5 and experimental assays performed on day 7. For LPS priming, cells plated overnight in bone marrow medium with M-CSF were incubated for 4–6 h at 37°C with 1 μg/ml LPS from E. coli 055:B5. Assays of ethidium bromide influx, as a measure of membrane pore formation, are as previously described (18). Cells were plated overnight in complete medium in a 96-well black plate at a seeding density of 1.5 × 106/ml. Complete medium was removed and cells incubated with 10 μM 2′,7′-dichlorodihydrofluorescein diacetate (H2DCFDA; Invitrogen) in DMEM/F12 with 2.5 mM probenecid for 40 min at 21 ± 3°C, under limited light conditions. Cells were washed in physiological salt solution containing 2.5 mM probenecid (37°C) 5 min before agonist application. Fluorescence was monitored every 10–25 s using a multidetection plate reader (FLUOstar Optima; BMG Labtech; excitation, 485 nm; emission, 520 nm). Data obtained were of three wells per experimental group. Data were analyzed using the formula FX − F0, where FX is the DCF fluorescence measured at the indicated time, and F0 is the DCF fluorescence measured at the beginning of analysis. Linear regression was performed on analyzed data to determine the rate of ROS generation. Cells were plated overnight in complete medium in 96-well clear plates at a seeding density of 1.5 × 106/ml. Complete medium was removed, and cells were incubated at 37°C in physiological salt solution containing the test substance. Supernatants (50 μl) were removed and added to a cytotoxicity detection kit (Roche Applied Science) reaction mixture (50 μl). Absorbance of samples at 490 nm was measured using a multidetection plate reader (FLUOstar Optima; BMG Labtech). Total cellular lactate dehydrogenase (LDH) was determined by the addition of 1% Triton X-100 to untreated cells and then the amount of LDH released expressed as a percentage of the total LDH release. LPS-primed (1 μg/ml, 4–6 h) BMDMs (1.5 × 106) were washed once in physiological salt solution and stimulated in physiological salt solution in the absence or presence of 5 mM ATP for 30 min at 37°C. Physiological salt solution above the cells was collected for analysis of secreted proteins and, following a wash step in ice-cold physiological salt solution, cells were lysed on ice in 75 μl of protease inhibitor cocktail plus 1% Triton X-100. Lysates and secreted protein fractions were cleared at 15,000 × g for 10 min at 4°C. Secreted protein fractions were concentrated (×6) using 3K Nanosep cut-off filters (VWR International) according to the manufacturer’s protocol. Solubilized proteins were resolved on a 12% SDS-PAGE gel and transferred onto nitrocellulose membrane. Nitrocellulose membrane was probed with mouse IL-1β mAb (Thermo Fisher Scientific) followed by rabbit anti-mouse IgG/HRP (Dako), and immune complexes were detected using the Amersham ECL Advance Western blotting detection agent. All data points shown are the means ± SEM from a minimum of three experiments performed in triplicate. Data were analyzed by one-way ANOVA with Dunnett’s post hoc or unpaired two-tailed Student’s t test using GraphPad Prism version 4.0. Dose-response curves were fit using Equation 1, where x is the logarithm of the molar concentration of the drug, α is the maxima (maximum response-baseline), log A50 is the 50% maximal response, and nH is the Hill slope. 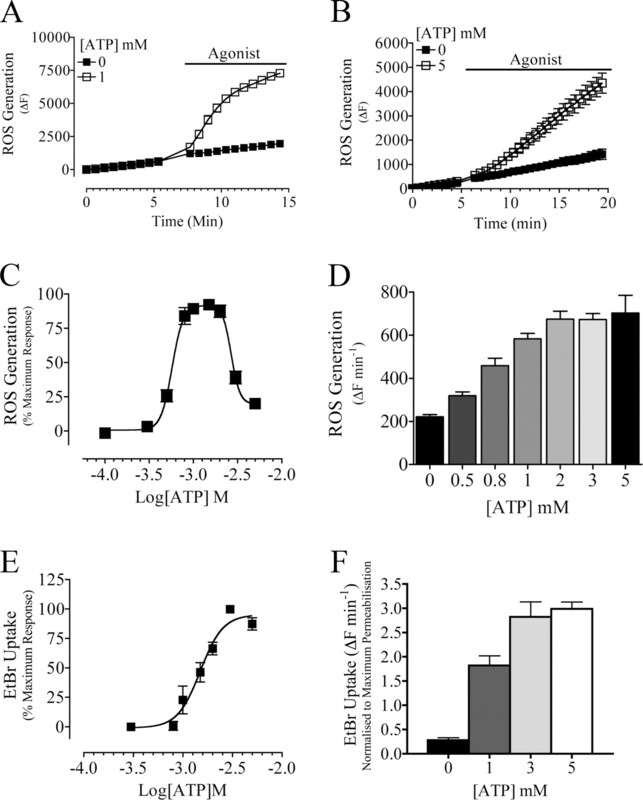 Addition of extracellular ATP triggers a sustained formation of ROS in endotoxin-primed J774.2 macrophages and BMDMs, detected by loading with H2DCFDA (Fig. 1⇓, A and B). In J774.2 macrophages, ATP initiates ROS generation with a bell-shaped concentration response curve with a peak response detected at 1 mM ATP (Fig. 1⇓C). The up-phase of the concentration response curve had an apparent EC50 value of 575 μM (pEC50 of 3.24 ± 0.04) and the down-phase an apparent IC50 value of 2.75 mM (2.56 ± 0.05) (n = 10 ± SEM) (Fig. 1⇓C). In contrast, ATP-mediated ethidium bromide (EtBr) influx displayed an EC50 value of 1.51 mM (pEC50 of 2.82 ± 0.03) (n = 3 ± SEM) (Fig. 1⇓E). Extracellular ATP initiated a slower generation of ROS in BMDMs with a peak response detected with 2 mM ATP, while EtBr influx is triggered with a peak response at 3 mM ATP (Fig. 1⇓, B, D, and F). Priming with LPS potentiated ATP-mediated ROS formation in J774.2 macrophages but not in BMDMs after subtracting the elevated background ROS formation resulting from LPS stimulation (Fig. 2⇓A–D). In contrast, ATP-mediated EtBr influx was unaltered in J774.2 macrophages following ATP stimulation, while it was elevated in LPS-primed BMDMs (Fig. 2⇓, E and F). ATP evokes ROS generation in murine macrophages. A, Representative trace demonstrating that 1 mM ATP evokes an increase in DCF fluorescence in J774 macrophages. B, Representative trace demonstrating that 5 mM ATP evokes an increase in DCF fluorescence in BMDMs. C, Concentration-response curve of ATP evoked ROS generation in J774 macrophages (pEC50 of 3.24 ± 0.04 and pEC50 of 2.56 ± 0.05) (n = 10 ± SEM). D, Histogram demonstrating concentration-dependent ATP-evoked ROS generation in BMDMs (n = 3 ± SEM). E, Concentration-response curve of ATP evoked EtBr influx in J774 macrophages (pEC50 of 2.82 ± 0.03) (n = 3 ± SEM). F, Histogram demonstrating concentration-dependent ATP-evoked EtBr influx in BMDMs (n = 3 ± SEM). Effect of endotoxin priming on ROS generation and EtBr uptake. A, Histogram demonstrating that ROS generation is enhanced when J774.2 macrophages are primed with 1 μg/ml for 4–6 h (n = 3 ± SEM). B, Histogram demonstrating that ROS generation is enhanced when BMDMs are primed with 1 μg/ml for 4–6 h (n = 3 ± SEM). C, Histogram demonstrating that LPS priming of J774.2 macrophages leads to an increase in ATP-evoked ROS generation once basal ROS generation is taken into account (n = 3 ± SEM). D, Histogram demonstrating that LPS priming of BMDMs does not lead to an increase in ATP-evoked ROS generation once basal ROS generation is taken into account (n = 3 ± SEM). E, Histogram demonstrating that LPS priming does not lead to increases in basal or ATP-evoked uptake of EtBr in J774.2 macrophages (n = 3 ± SEM). F, Histogram demonstrating that LPS priming leads to increases in ATP-evoked but not basal uptake of EtBr in BMDMs (n = 3 ± SEM). ∗, p < 0.05; ∗∗, p < 0.01; ∗∗∗, p < 0.001 by Student’s two-tailed t test. For both J774.2 and BMDMs, preincubation with 100 μM DPI or 20 mM N-acetylcysteine (NAC) blocked ATP-mediated ROS generation (Figs. 3⇓, A and B, and 4⇓, A and B). DPI is an inhibitor of flavin-containing enzymes that include NADPH oxidase, mitochondrial complex I, xanthine oxidase, and NO synthase. We also tested inhibitors of each enzyme complex. Preincubation of J774.2 cells with either 100 μM allopurinol, a xanthine oxidase inhibitor, or 1 mM l-NAME (NG-nitro-l-arginine methyl ester), a broad-spectrum NO synthase inhibitor, did not inhibit ATP-mediated ROS formation (Fig. 3⇓, C and D). Addition of 5 μM rotenone (an inhibitor of mitochondrial complex I) to J774.2 macrophages did not inhibit ROS formation, but it did partially antagonize ATP-evoked ROS formation detected in BMDMs (Figs. 3⇓E and 4⇓C). For each of these inhibitors, ATP-mediated EtBr influx was measured as an indicator of receptor stimulation and subsequent pore formation (data not shown). None of the above inhibitors affected ATP-induced EtBr influx in J774.2 or BMDMs, demonstrating that any observed inhibition was not a direct action at the receptor, as well as suggesting that no redox modulation of pore formation occurs. 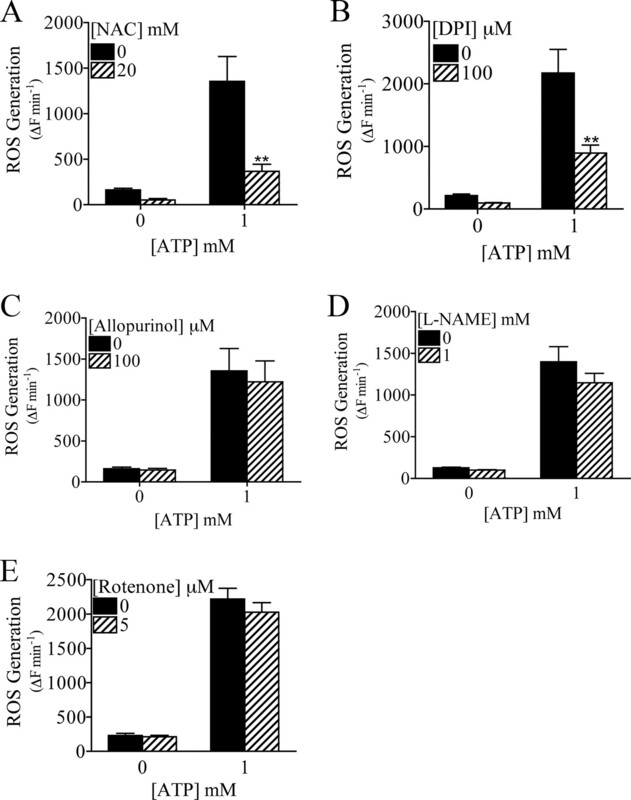 Effect of ROS inhibitors on ATP-evoked cellular oxidation in J774 macrophages. A, Histogram demonstrating inhibition of ATP-evoked ROS generation by preincubating cells with NAC (20 mM, 2 h) (n = 3 ± SEM). B, Histogram demonstrating inhibition of ATP-evoked ROS generation by preincubating cells with DPI (100 μM, 1.5 h) (n = 3 ± SEM). C, Histogram demonstrating that the xanthine oxidase inhibitor allopurinol (100 μM, 30 min) does not inhibit ATP-evoked ROS generation (n = 3 ± SEM). D, Histogram demonstrating that the NO synthase inhibitor l-NAME (1 mM, 1 h) does not inhibit ATP-evoked ROS generation (n = 3 ± SEM). E, Histogram demonstrating that the complex I inhibitor rotenone (5 μM, 30 min) does not inhibit ATP-evoked ROS generation (n = 3 ± SEM). ∗∗, p < 0.01 by Student’s two-tailed t test. 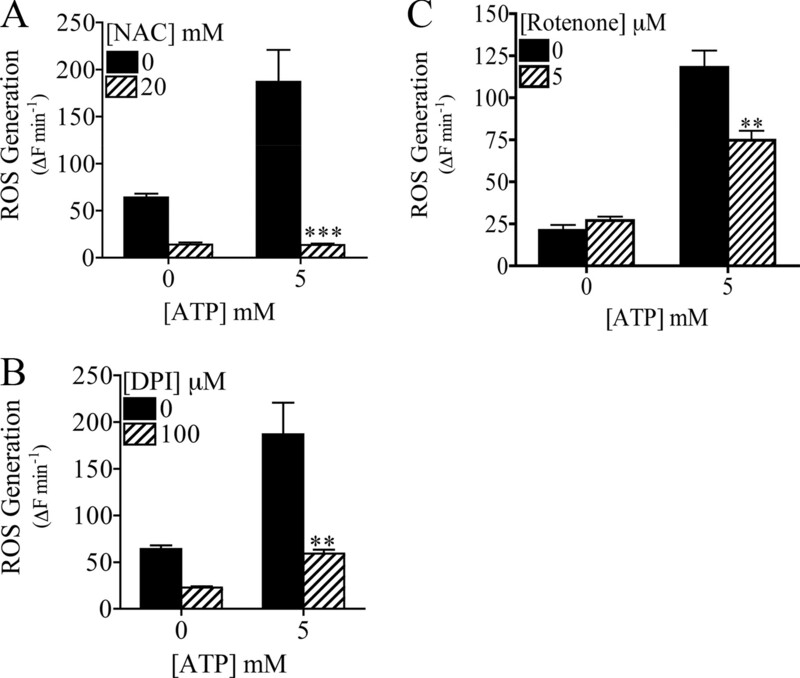 Effect of ROS inhibitors on ATP-evoked cellular oxidation in BMDMs. A, Histogram demonstrating inhibition of ATP-evoked ROS generation by preincubating cells with NAC (20 mM, 2 h) (n = 3 ± SEM). B, Histogram demonstrating inhibition of ATP-evoked ROS generation by preincubating cells with DPI (100 μM, 1.5 h) (n = 3 ± SEM). C, Histogram demonstrating that the complex I inhibitor rotenone (5 μM, 30 min) inhibits ATP-evoked ROS generation in J774.2 cells (n = 3 ± SEM). ∗∗, p < 0.01; ∗∗∗, p < 0.001 by Student’s two-tailed t test. To analyze the involvement of the phagocytic NOX isoform NOX2, BMDMs were isolated from wild-type and NOX2 (gp91phox)-deficient mice. Macrophages were generated from bone marrow cultured in the presence of M-CSF. No difference was observed in final cell number in cells differentiated in M-CSF from wild-type or NOX2−/− bone marrow (data not shown). ATP-stimulated ROS generation was strongly attenuated in NOX2−/− macrophages compared with wild-type macrophages (Fig. 5⇓, A and B). In contrast, ATP-mediated EtBr influx and IL-1β processing was comparable between NOX2−/− and wild-type macrophages (Fig. 5⇓C and supplemental Fig. 1).4 We conclude that NOX2 plays a central role in extracellular ATP-mediated ROS generation in primary macrophages. 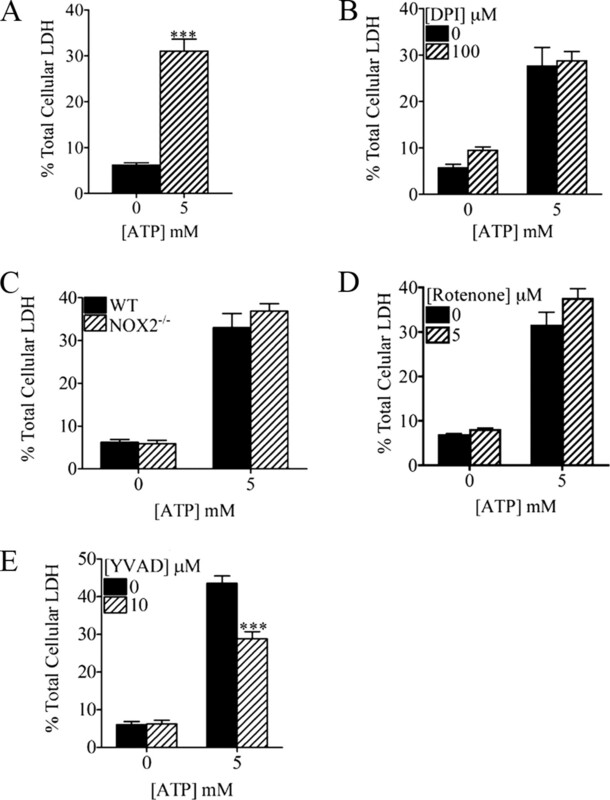 Evidence for ATP-evoked activation of NADPH oxidase in generating ROS. A, Representative trace demonstrating that 5 mM ATP evokes an increase in DCF fluorescence in wild-type (WT) but not NOX2−/− BMDMs. B, Histogram demonstrating that ATP does not evoke ROS generation in BMDMs from NOX2−/− mice above control (n = 5 ± SEM). C, Histogram demonstrating that ATP evokes EtBr influx at similar levels in WT and NOX2−/− BMDMs (n = 5 ± SEM). ∗∗∗, p < 0.001 by Student’s two-tailed t test. NADPH oxidase activation results in the liberation of electrons that combine with oxygen to form superoxide anions. Previously we have reported that exposure of human monocytes to extracellular ATP triggers the extracellular generation of superoxide anions (2). To investigate whether ATP stimulation of macrophages results in the formation of superoxide anions, we have investigated the effect of extracellular superoxide dismutase (SOD) and a cell-permeant SOD mimetic. Superoxide anions will react with SOD to generate H2O2. The addition of extracellular SOD to J774.2 macrophages did not alter ATP-mediated oxidation. However preincubation with a membrane-permeant SOD mimetic (Mn-cpx 3; Calbiochem) augmented ATP-triggered ROS formation presumably due to the intracellular generation of H2O2 (Fig. 6⇓, A and B). These data suggest that ATP triggers the formation of superoxide anions at internal membranes in J774.2 macrophages. 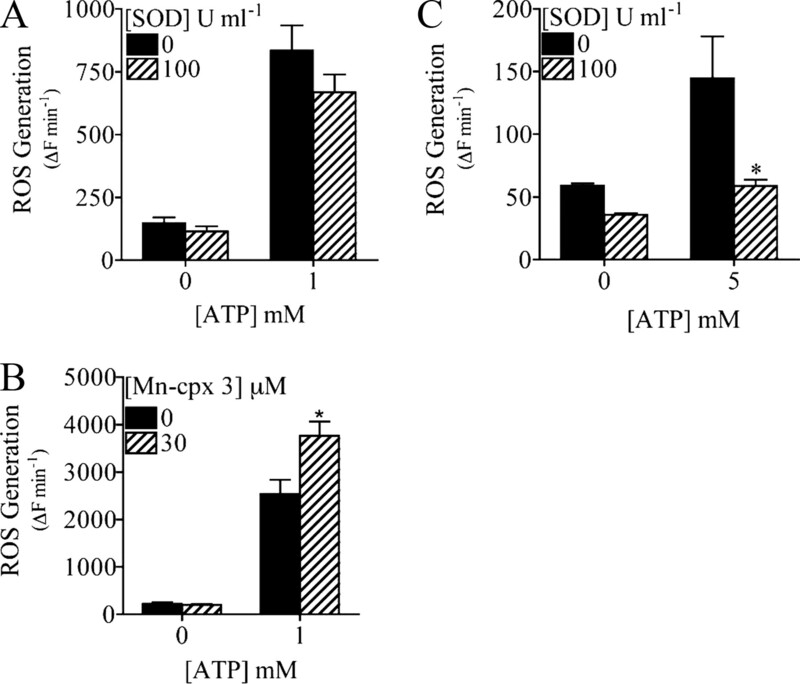 In contrast, addition of extracellular SOD to BMDMs partially antagonized ATP-mediated ROS formation (Fig. 6⇓C), indicating extracellular generation of superoxide anions. Spatial localization of superoxide anion formation. A, Histogram demonstrating that extracellular SOD (100 U/ml) does not affect ATP-induced ROS generation in J774 macrophages (n = 3 ± SEM). B, Histogram demonstrating that a cell-permeant SOD mimetic (Mn-cpx 3) significantly increases ATP-evoked ROS generation in J774 macrophages (n = 3 ± SEM). C, Histogram demonstrating that extracellular SOD (100 U/ml) significantly decreases BMDM cellular oxidation induced by ATP (n = 3 ± SEM). ∗, p < 0.05 by Student’s two-tailed t test. We have investigated the redox dependence of P2X7 receptor-mediated necrosis in J774.2 macrophages and BMDMs. ATP stimulation of J774.2 macrophages triggers rapid cell necrosis detectable by the release of LDH following a 30-min agonist application (Fig. 7⇓A). ATP-dependent cell lysis was concentration-dependent, with a variable peak response from 1 to 3 mM ATP followed by a decline at higher concentrations (Fig. 7⇓, B and F). This pharmacological profile is comparable to ATP-induced ROS generation. Treatment of J774.2 cells with 100 μM DPI attenuated LDH release, while 5 μM rotenone had no affect on cell necrosis (Fig. 7⇓, C and D). 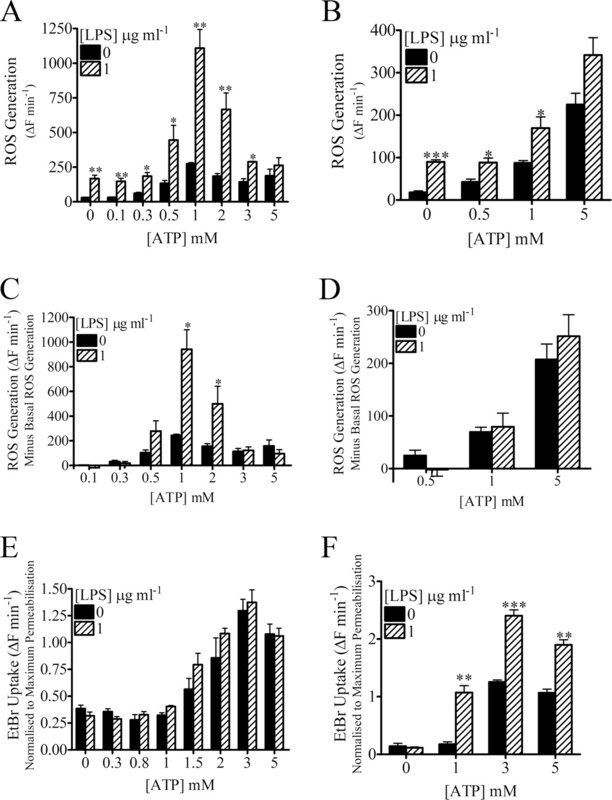 Preincubation with Tyr-Val-Ala-Asp-fluoromethyl ketone (Z-YVAD-FMK; Cambridge Bioscience) (10 μM, 30 min), a caspase-1 peptide inhibitor, partially attenuated ATP-mediated LDH release (Fig. 7⇓E). In contrast, ATP-mediated IL-1β processing was strongly blocked in J744.2 macrophages treated with 10 μM Z-YVAD-FMK (data not shown). Preincubating cells with Ca-074 Me (Calbiochem) (100 μM, 30 min), a cathepsin B inhibitor, also partially inhibited ATP-mediated cell necrosis, suggesting the involvement of multiple proteases (Fig. 7⇓F). Role of ROS in ATP-induced cell death in J774 macrophages. A, Histogram demonstrating that 1 mM ATP evokes LDH release after a 30- to 60-min stimulation (n = 3 ± SEM). B, Histogram demonstrating that only 1 mM ATP evoked a significant release of LDH (n = 3 ± SEM). C, Histogram demonstrating that DPI significantly inhibited LDH release from cells stimulated with 1 mM ATP (n = 3 ± SEM). D, Histogram demonstrating that rotenone did not significantly effect LDH release from cells stimulated with 1 mM ATP (n = 3 ± SEM). E, Histogram demonstrating that Z-YVAD-FMK significantly inhibited LDH release from cells stimulated with 1 mM ATP for 60 min (n = 3 ± SEM). F, Histogram demonstrating that Ca-074 Me significantly inhibited LDH release from ATP-stimulated cells (n = 3 ± SEM). ∗, p < 0.05; ∗∗, p < 0.001; ∗∗∗, p < 0.001 by Student’s two-tailed t test. Extracellular ATP stimulation of BMDMs also resulted in rapid cell necrosis where LDH release was detected following 30 min stimulation with 5 mM ATP (Fig. 8⇓A). However, in contrast to J774.2 macrophages, 100 μM DPI did not inhibit ATP-mediated membrane necrosis (Fig. 8⇓B). Moreover, ATP stimulation of NOX2−/− macrophages also resulted in release of LDH comparable to wild-type macrophages (Fig. 8⇓C). 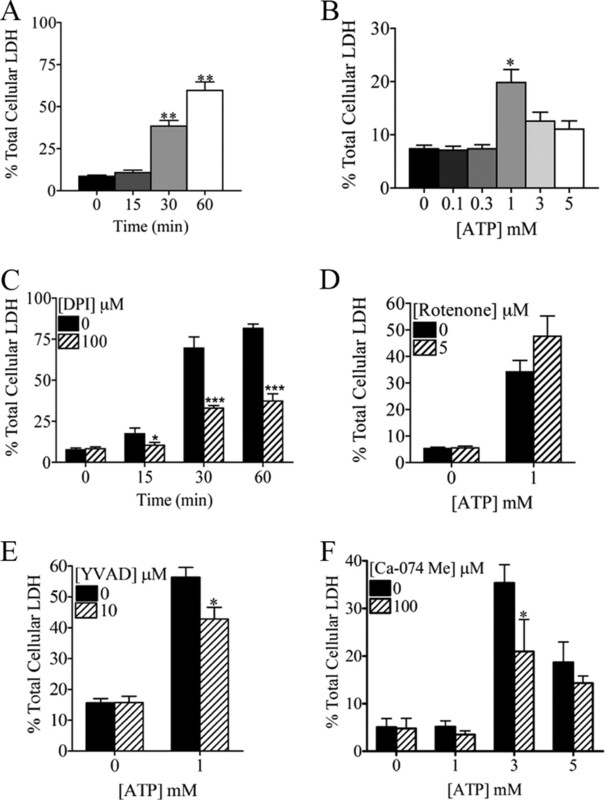 Finally, 5 μM rotenone had no affect on ATP-mediated LDH release, while Z-YVAD-FMK partially antagonized cell necrosis (Fig. 8⇓, D and E). ATP-mediated IL-1β processing, reflecting caspase-1 activation, was attenuated in BMDMs treated with 10 μM Z-YVAD-FMK (data not shown). In summary, cell necrosis was DPI-sensitive in J774.2 macrophages, but both DPI-insensitive and NOX2-independent in BMDMs. ROS appear to not be involved in ATP-induced cell death in BMDMs. A, Histogram demonstrating that 5 mM ATP evokes LDH release from BMDMs after a 60-min stimulation (n = 3 ± SEM). B, Histogram demonstrating that DPI failed to significantly inhibit LDH release from BMDMs stimulated with 5 mM ATP for 60 min (n = 3 ± SEM). C, Histogram demonstrating that ATP-evoked LDH release from NOX2−/− BMDMs did not significantly differ from wild-type (WT) BMDMs (n = 3 ± SEM). D, Histogram demonstrating that rotenone did not significantly effect LDH release from BMDMs stimulated with 5 mM ATP for 60 min (n = 3 ± SEM). E, Histogram demonstrating that Z-YVAD-FMK significantly inhibited LDH release from cells stimulated with 5 mM ATP for 60 min (n = 3 ± SEM). ∗∗∗, p < 0.001 by Student’s two-tailed t test. NOX2 plays an important role in bactericidal activity of phagocytes and in supporting innate immunity. Controlled NOX2 activation is fundamental for antimicrobial defense and phagocytosis. However, deregulated NOX2 activity could lead to adjacent tissue damage and propagation of an inflammatory response. Patients lacking functional NADPH oxidase and NOX2 develop chronic granulomatous disease characterized by increased susceptibility to microbial infections, particularly aspergillus (19). Several reports have implicated NADPH oxidase in P2X7 receptor-mediated ROS generation in a range of phagocytic cells, including human monocytes, murine macrophages, and microglial cells (2, 12, 20, 21). We have demonstrated that high concentrations of extracellular ATP triggers an increase in ROS formation where J774.2 macrophages had an apparent EC50 of 575 μM that contrasts with the EtBr influx EC50 value of 1.5 mM. This leftward shift in the concentration response curve for ATP-mediated oxidation may reflect the contribution of other P2 receptors in addition to a potential underestimation of the EC50 value due to the bell-shaped concentration response curve. In contrast, in BMDMs, ATP triggered ROS formation with a peak response at 2 mM ATP and EtBr at a peak response at 3 mM. The high concentrations of ATP that are required to trigger ROS formation suggests the contribution of P2X7 receptors but does not eliminate additional contribution from other P2 receptors. We confirm that exposure of LPS-primed macrophages to extracellular ATP leads to a rapid burst in cellular oxidation blocked by an inhibitor of flavoproteins, DPI. 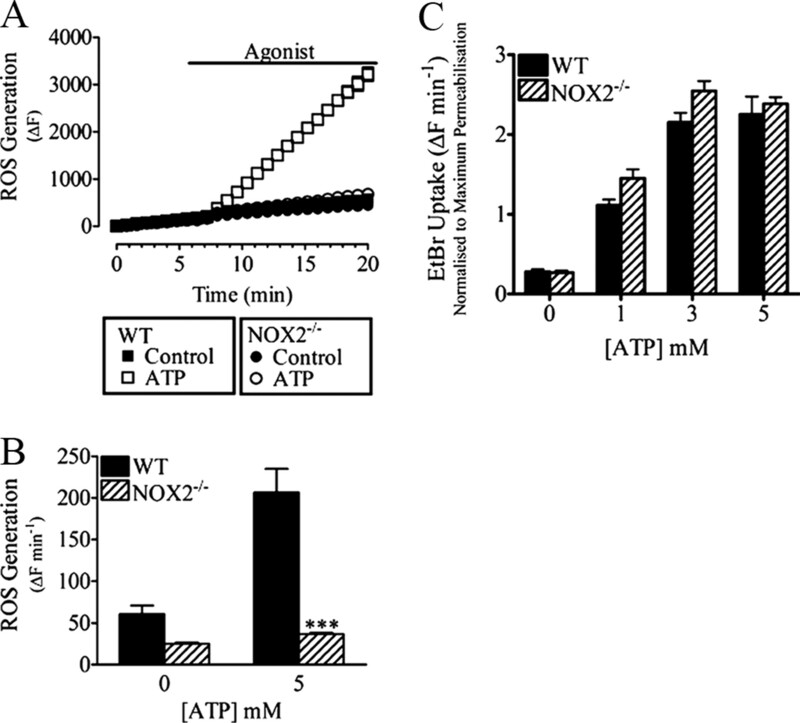 This study demonstrates that ATP stimulation of endotoxin-primed macrophages triggers rapid activation of NOX2 where ATP-mediated oxidation is abrogated in NOX2-deficient macrophages. We have examined the action of the pathogen-associated molecular pattern LPS on both basal levels of cellular oxidation and ATP-stimulated bursts in oxidation. LPS stimulation of primary macrophages and J774.2 macrophages led to an increase in basal oxidation. In J774.2 macrophages, ATP-mediated oxidation was also increased; however, EtBr influx was unchanged, suggesting an increase in NOX2-associated proteins or signaling pathways. In contrast, ATP-mediated oxidation above basal oxidation was unchanged in primary BMDMs, but ATP-mediated EtBr influx was potentiated. We hypothesize that the increase in EtBr may reflect an increased expression of P2X7 receptors or pannexin-1, but the P2X7-NOX2 signaling pathway is unchanged. This is the first demonstration in endotoxin-primed primary macrophages that ATP stimulation leads to the activation of the NOX2 isoform. The ability of ATP to stimulate NADPH oxidase appears to be tissue-specific, as a recent study in peritoneal macrophages reported no change in ATP-mediated oxidation in NOX2-deficient cells (22). P2X7 receptors are associated with a number of pathophysiological responses, including inflammatory and neuropathic pain. Several studies have implicated superoxide anions in the pathology of hyperalgesia (clinically described as augmented sensitivity to painful stimuli) associated with inflammation. Indeed, treatment with either a SOD mimetic or radical scavenging agents attenuated hyperalgesia associated with carrageenan-induced peripheral inflammation (23, 24). NOX1 NADPH oxidase has been shown to be expressed by dorsal root ganglia neurons and to mediate superoxide anion generation (14). Thermal and mechanical hyperalgesia was significantly reduced in NOX1-deficient mice, suggesting a role of the NOX1 NADPH oxidase isoform (14). With the known role of ATP signaling in the pathogenesis of inflammatory pain, a role for macrophage NOX2 should also be investigated. Notably, we and other groups have reported an inhibitory effect of DPI and antioxidants on ATP-, silica-, and monosodium urate crystal-mediated IL-1β processing in human THP-1 monocytes (2, 25, 26). Indeed, small hairpin RNA knockdown of p22phox expression leads to an inhibition of MSU-mediated IL-1β processing in THP-1 monocytes (25). However, monosodium urate-, silica-, and ATP-mediated IL-1β processing and secretion are not inhibited in NOX2-deficient murine macrophages (22, 27) (supplemental Fig. 1). These data would suggest either a redundancy for NADPH oxidase in the ATP-mediated IL-1β processing pathway or a fundamental difference in human vs mouse signaling pathways. NADPH oxidase activity depends on spatial regulation of the cytosolic components and the recruitment of NOX subunits to either cell surface or internal organelle membranes. We predict that additional extracellular SOD will react with superoxide anions liberated by plasma membrane-associated NADPH oxidase. Indeed, extracellular SOD attenuated ATP-mediated ROS formation in primary BMDMs comparable to previously reported responses in primary human monocytes and a THP-1 human monocyte cell line (2). These data would suggest partial localization of NADPH oxidase to the plasma membrane of the primary BMDMs. In contrast, ATP-mediated ROS formation in J774.2 macrophages was potentiated by a cell-permeable SOD mimetic but not by external SOD. Detection of a fluorescent signal in J774.2 macrophages, but not in BMDMs, following the formation of membrane-permeable H2O2 suggests an additional reaction in J774.2 macrophages. We hypothesize that SOD mimetic-formed H2O2 is converted into hydroxyl radicals that are readily detected by the DCF dye (28). The differential action of extracellular SOD suggests that, at least in J774.2 macrophages, superoxide anions could be being generated within membrane-bound compartments in the cell. The nature of ROS means they are diffusible, short-lived molecules, and therefore localizing ROS production to a specific subcellular compartment could be of importance for activating certain redox signaling events. In primary macrophages, the apparent plasma membrane localization of NOX2 prompts future studies to investigate subcellular distribution and whether NOX2 maybe be co-secreted with other membrane proteins within microvesicles and/or exosomes (3, 29). Finally, cell death is an important component of the innate immune system, leading to either resolution or propagation of inflammation. Apoptosis is a caspase-dependent form of cell death, which is defined by a range of biochemical and morphological hallmarks that will ultimately result in the clearance of host cells by phagocytic cells before the release of their inflammatory contents. Necrotic forms of cell death, however, are characterized by a breakdown of the plasma membrane, leading to the release of cellular constituents that could provoke an inflammatory response (30, 31). For example, macrophages may release cytokines, heat shock proteins, and high-mobility group box 1 (HMGB1) that are all potently proinflammatory and will make an important contribution to the innate immune response. Necrosis is a caspase-independent pathway that occurs in the absence of apoptotic hallmarks. However, the molecular signaling pathways leading to cell necrosis are not completely understood. Recently, two novel forms of cell death have been described, pyroptosis and pyronecrosis, both of which are also characterized by a breakdown of the plasma membrane leading to the release of cellular constituents. Pyroptosis has been demonstrated to be dependent on the activation of caspase-1 through the use of caspase-1 peptide blockers and caspase-1-deficient macrophages and will result in cell lysis leading to the release of inflammatory proteins (32, 33). Pyroptosis requires the assembly of the apoptosis-associated speck-like protein containing a caspase-recruitment domain (ASC) into a supramolecular complex that triggers caspase-1 activation, a protease that leads not only to cell death via pyroptosis but also the generation of the inflammatory cytokine IL-1β. In contrast, pyronecrosis is caspase-1-independent and results from cathepsin B activation leading to cell lysis. Pyronecrosis has been observed in macrophages infected with Shigella flexneri (34). Endotoxin-primed BMDMs are reported to undergo rapid caspase-1-dependent pyroptosis upon stimulation with extracellular ATP where cell lysis is completely abolished in caspase-1-deficient BMDMs (32). This study highlights a key role for the ASC pyroptosome in caspase-1-dependent cell lysis in endotoxin-stimulated monocytes and macrophages. However, a second study reports a P2X7 receptor-dependent cell necrosis that is only partially dependent on caspase-1 activation in LPS-primed peritoneal macrophages (35). Moreover, we have reported ATP-mediated necrosis of RAW264.7 murine macrophages that do not express the adaptor protein ASC required for pyroptosis (18, 36). Finally, several studies have reported ATP stimulation that triggers robust caspase-1-dependent IL-1β processing in the absence of detectable cell necrosis (2, 3, 36, 37). Few studies have investigated the role of oxidation in P2X7 receptor-mediated cell death. Noguchi and coworkers (12) reported that redox-dependent activation of ASK1 is partially responsible for ATP-mediated apoptosis (6 h) in spleen-derived murine macrophages, while NOX2 is partially responsible for ATP-mediated ROS generation and apoptosis in RAW264.7 macrophages. In contrast, Pfeiffer et al. (4) reported that ATP stimulation of RAW264.7 macrophages leads to a loss of cell viability (detected after 4 h with a MTT metabolic assay) that is unaffected by antioxidants. Neither study directly investigated the role of ROS, NOX2, and caspase-1 activation in rapid (<1 h) ATP-mediated cell necrosis in both primary macrophages and a murine macrophage cell line. In the present study, ATP-induced necrosis of LPS-primed J774.2 macrophages and BMDMs was partially blocked with the caspase-1 inhibitor Z-YVAD-FMK. Furthermore, ATP-evoked cell death in LPS-primed J774.2 macrophages was also partially blocked with the cathepsin B inhibitor Ca-074 Me, thus demonstrating that multiple proteases are involved in ATP-evoked cell death and therefore may not be primarily dependent on either a pyroptotic or pyronecrotic pathway. In J774.2 macrophages, ATP-induced cell death was also inhibited by DPI; however, cell death in BMDMs was found to still occur in the presence of DPI and was not dependent on the expression of NOX2. These results demonstrate that ATP stimulation of endotoxin-primed murine macrophages results in rapid cell necrosis, but further studies are required to elucidate the signaling pathways underlying this inflammatory form of cell death and why differences are observed between different monocyte/macrophage models. The differences in spatial localization of ROS generation between the two cell types and the role of mitochondrial complex I in BMDM ROS generation may explain the differential redox dependence of ATP-evoked cell death between J774.2 macrophages and BMDMs. The effects of oxidants on redox signaling are largely cell- and stimulus-specific (38). Therefore, differences in the redox properties of different macrophages should be expected; for example, alveolar macrophages are observed to have high basal NADPH oxidase activity (39). Here we have demonstrated that ATP-evoked generation of ROS in endotoxin-primed macrophages occurs primarily by activation of NOX2. Our observations have also indicated that extracellular ATP can evoke ROS generation at different locations and via different generators depending on the macrophage type potentially leading to the activation of different cellular signaling pathways. This therefore demonstrates that observations from one macrophage type may not be simply extrapolated to different types and sources of macrophages. We thank Professor Ajay Shah and Dr. Alison Cave (Kings College, London, U.K.) for providing tissue from NOX2 knockout animals. ↵1 This work was supported by grants from the University of Bath and Heart Research UK. ↵3 Abbreviations used in this paper: ROS, reactive oxygen species; ASC, apoptosis-associated speck-like protein containing a caspase-recruitment domain; BMDM, bone marrow-derived macrophage; DPI, diphenyleneiodonium; EtBr, ethidium bromide; H2DCFDA, 2′,7′-dichlorodihydrofluorescein diacetate; LDH, lactate dehydrogenase; NAC, N-acetylcysteine; P2X7R, P2X7 receptor; SOD, superoxide dismutase; Z-YVAD-FMK, Tyr-Val-Ala-Asp-fluoromethyl ketone. Surprenant, A., R. A. North. 2008. Signaling at purinergic P2X receptors. Annu. Rev. Physiol. 71: 333-359. Hewinson, J., S. Moore, C. Glover, A. Watts, A. MacKenzie. 2008. A key role for redox signaling in rapid P2X7 receptor-induced IL-1β processing in human monocytes. J. Immunol. 180: 8410-8420. MacKenzie, A., H. Wilson, E. Kiss-Toth, S. Dower, R. North, A. Surprenant. 2001. Rapid secretion of interleukin-1β by microvesicle shedding. Immunity 15: 825-835. Pfeiffer, Z., A. Guerra, L. Hill, M. Gavala, U. Prabhu, M. Aga, D. Hall, P. Bertics. 2007. Nucleotide receptor signaling in murine macrophages is linked to reactive oxygen species generation. Free Radical Biol. Med. 42: 1506-1516. Solle, M., J. Labasi, D. Perregaux, E. Stam, N. Petrushova, B. Koller, R. Griffiths, C. Gabel. 2001. Altered cytokine production in mice lacking P2X7 receptors. J. Biol. Chem. 276: 125-132. Chessell, I., J. Hatcher, C. Bountra, A. Michel, J. Hughes, P. Green, J. Egerton, M. Murfin, J. Richardson, W. Peck, et al 2005. Disruption of the P2X7 purinoceptor gene abolishes chronic inflammatory and neuropathic pain. Pain 114: 386-396. Ke, H., H. Qi, A. Weidema, Q. Zhang, N. Panupinthu, D. Crawford, W. Grasser, V. Paralkar, M. Li, L. Audoly, et al 2003. Deletion of the P2X7 nucleotide receptor reveals its regulatory roles in bone formation and resorption. Mol. Endocrinol. 17: 1356-1367. Labasi, J., N. Petrushova, C. Donovan, S. McCurdy, P. Lira, M. Payette, W. Brissette, J. Wicks, L. Audoly, C. Gabel. 2002. Absence of the P2X7 receptor alters leukocyte function and attenuates an inflammatory response. J. Immunol. 168: 6436-6445. Broom, D., D. Matson, E. Bradshaw, M. Buck, R. Meade, S. Coombs, M. Matchett, K. Ford, W. Yu, J. Yuan, et al 2008. Characterization of N-(adamantan-1-ylmethyl)-5-[(3R-amino-pyrrolidin-1-yl)methyl]-2-chloro-benzamide, a P2X7 antagonist in animal models of pain and inflammation. J. Pharmacol. Exp. Ther. 327: 620-633. Donnelly-Roberts, D., M. Jarvis. 2007. Discovery of P2X7 receptor-selective antagonists offers new insights into P2X7 receptor function and indicates a role in chronic pain states. Br. J. Pharmacol. 151: 571-579. Stokes, L., L. Jiang, L. Alcaraz, J. Bent, K. Bowers, M. Fagura, M. Furber, M. Mortimore, M. Lawson, J. Theaker, et al 2006. Characterization of a selective and potent antagonist of human P2X7 receptors, AZ11645373. Br. J. Pharmacol. 149: 880-887. Noguchi, T., K. Ishii, H. Fukutomi, I. Naguro, A. Matsuzawa, K. Takeda, H. Ichijo. 2008. Requirement of reactive oxygen species-dependent activation of ASK1–p38 MAPK pathway for extracellular ATP-induced apoptosis in macrophage. J. Biol. Chem. 283: 7657-7665. Cathcart, M.. 2004. Regulation of superoxide anion production by NADPH oxidase in monocytes/macrophages: contributions to atherosclerosis. Arterioscler. Thromb. Vasc. Biol. 24: 23-28. Ibi, M., K. Matsuno, D. Shiba, M. Katsuyama, K. Iwata, T. Kakehi, T. Nakagawa, K. Sango, Y. Shirai, T. Yokoyama, et al 2008. Reactive oxygen species derived from NOX1/NADPH oxidase enhance inflammatory pain. J. Neurosci. 28: 9486-9494. Barry-Lane, P., C. Patterson, M. van der Merwe, Z. Hu, S. Holland, E. Yeh, M. Runge. 2001. p47phox is required for atherosclerotic lesion progression in ApoE−/− mice. J. Clin. Invest. 108: 1513-1522. Bedard, K., K. Krause. 2007. The NOX family of ROS-generating NADPH oxidases: physiology and pathophysiology. Physiol. Rev. 87: 245-313. Lin, H., C. Chen, B. Chen. 2001. Resistance of bone marrow-derived macrophages to apoptosis is associated with the expression of X-linked inhibitor of apoptosis protein in primary cultures of bone marrow cells. Biochem. J. 353: 299-306. Moore, S. F., A. B. MacKenzie. 2007. Murine macrophage P2X7 receptors support rapid prothrombotic responses. Cell. Signal. 19: 855-866. Dinauer, M., S. Orkin, R. Brown, A. Jesaitis, C. Parkos. 1987. The glycoprotein encoded by the X-linked chronic granulomatous disease locus is a component of the neutrophil cytochrome b complex. Nature 327: 717-720. Parvathenani, L., S. Tertyshnikova, C. Greco, S. Roberts, B. Robertson, R. Posmantur. 2003. P2X7 mediates superoxide production in primary microglia and is up-regulated in a transgenic mouse model of Alzheimer’s disease. J. Biol. Chem. 278: 13309-13317. Kim, S. Y., J. H. Moon, H. G. Lee, S. U. Kim, Y. B. Lee. 2007. ATP released from β-amyloid-stimulated microglia induces reactive oxygen species production in an autocrine fashion. Exp. Mol. Med. 39: 820-827. Meissner, F., K. Molawi, A. Zychlinsky. 2008. Superoxide dismutase 1 regulates caspase-1 and endotoxic shock. Nat. Immunol. 9: 866-872. Khattab, M.. 2006. TEMPOL, a membrane-permeable radical scavenger, attenuates peroxynitrite- and superoxide anion-enhanced carrageenan-induced paw edema and hyperalgesia: a key role for superoxide anion. Eur. J. Pharmacol. 548: 167-173. Wang, Z., F. Porreca, S. Cuzzocrea, K. Galen, R. Lightfoot, E. Masini, C. Muscoli, V. Mollace, M. Ndengele, H. Ischiropoulos, D. Salvemini. 2004. A newly identified role for superoxide in inflammatory pain. J. Pharmacol. Exp. Ther. 309: 869-878. Dostert, C., V. Pétrilli, R. Van Bruggen, C. Steele, B. T. Mossman, J. Tschopp. 2008. Innate immune activation through Nalp3 inflammasome sensing of asbestos and silica. Science 320: 674-677. Hornung, V., F. Bauernfeind, A. Halle, E. O. Samstad, H. Kono, K. L. Rock, K. A. Fitzgerald, E. Latz. 2008. Silica crystals and aluminum salts activate the NALP3 inflammasome through phagosomal destabilization. Nat. Immunol. 9: 847-856. Setsukinai, K., Y. Urano, K. Kakinuma, H. J. Majima, T. Nagano. 2003. Development of novel fluorescence probes that can reliably detect reactive oxygen species and distinguish specific species. J. Biol. Chem. 278: 3170-3175. Qu, Y., L. Ramachandra, S. Mohr, L. Franchi, C. V. Harding, G. Nunez, G. R. Dubyak. 2009. P2X7 receptor-stimulated secretion of MHC class II-containing exosomes requires the ASC/NLRP3 inflammasome but is independent of caspase-1. J. Immunol. 182: 5052-5062. Fink, S., B. Cookson. 2005. Apoptosis, pyroptosis, and necrosis: mechanistic description of dead and dying eukaryotic cells. Infect. Immun. 73: 1907-1916. Labbé, K., M. Saleh. 2008. Cell death in the host response to infection. Cell Death Differ. 15: 1339-1349. Fernandes-Alnemri, T., J. Wu, J. W. Yu, P. Datta, B. Miller, W. Jankowski, S. Rosenberg, J. Zhang, E. S. Alnemri. 2007. The pyroptosome: a supramolecular assembly of ASC dimers mediating inflammatory cell death via caspase-1 activation. Cell Death Differ. 14: 1590-1604. Kroemer, G., L. Galluzzi, P. Vandenabeele, J. Abrams, E. S. Alnemri, E. H. Baehrecke, M. V. Blagosklonny, W. S. El-Deiry, P. Golstein, D. R. Green, et al 2009. Classification of cell death: recommendations of the Nomenclature Committee on Cell Death 2009. Cell Death Differ. 16: 3-11. Willingham, S. B., D. T. Bergstralh, W. O'Connor, A. C. Morrison, D. J. Taxman, J. A. Duncan, S. Barnoy, M. M. Venkatesan, R. A. Flavell, M. Deshmukh, et al 2007. Microbial pathogen-induced necrotic cell death mediated by the inflammasome components CIAS1/cryopyrin/NLRP3 and ASC. Cell Host Microbe 2: 147-159. Le Feuvre, R., D. Brough, Y. Iwakura, K. Takeda, N. Rothwell. 2002. Priming of macrophages with lipopolysaccharide potentiates P2X7-mediated cell death via a caspase-1-dependent mechanism, independently of cytokine production. J. Biol. Chem. 277: 3210-3218. Pelegrin, P., C. Barroso-Gutierrez, A. Surprenant. 2008. P2X7 receptor differentially couples to distinct release pathways for IL-1β in mouse macrophage. J. Immunol. 180: 7147-7157. Grahames, C. B., A. D. Michel, I. P. Chessell, P. P. Humphrey. 1999. Pharmacological characterization of ATP- and LPS-induced IL-1β release in human monocytes. Br. J. Pharmacol. 127: 1915-1921. Forman, H., M. Torres. 2001. Redox signaling in macrophages. Mol. Aspects Med. 22: 189-216. Tephly, L., A. Carter. 2007. Constitutive NADPH oxidase and increased mitochondrial respiratory chain activity regulate chemokine gene expression. Am. J. Physiol. 293: L1143-L1155.